We seek to be a community of welcoming, compassionate, caring people who strive to make Christ known through faith, hope, and love. You are welcome to join us Sunday Mornings! We celebrated our 125th Anniversary in 2018! 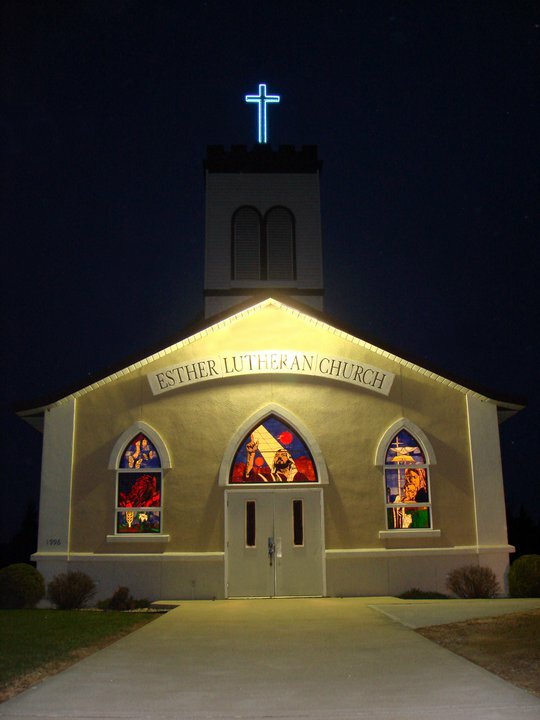 Esther Lutheran Church is a small thriving rural congregation nestled among pine trees near Parkers Prairie, Minnesota. The minute you walk through the doors of this building you will see the beautiful stained glass window and hear the bubbling conversations of the congregants as they share with one another the joys and sorrow of the past week. The congregation entails over 200 baptized members who farm, work in small businesses, attend school or are retired. Oftentimes there may be three to four generations in worship services on a given Sunday. The strength of family and an open welcome is key to the growth of Esther Lutheran and gives the congregation its vitality. You will notice the wide diversity of age groups in the congregation from very old to very young and can at times be overrun with the bustling of small children from the basement Sunday School classes.